March- October: Tuesday to Sunday, 10 am to 8 pm. 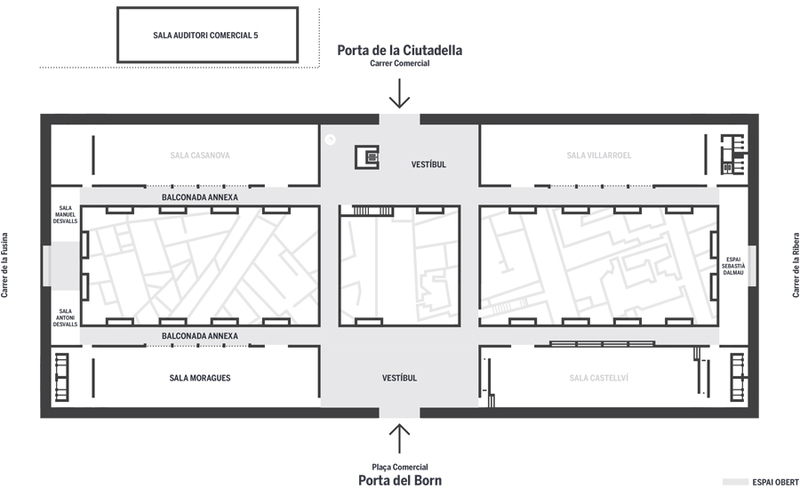 Admission is free during these opening times, via the Plaça Comercial and Carrer Comercial entrances. An admission charge applies to the exhibition spaces and archaeological site. Admission to exhibition spaces ends 30 minutes before closing time. The Plaça Comercial entrance will remain open between 8 pm and midnight to allow access to the Food Hall. El Born CCM is closed on Mondays, except for bank holiday Mondays. On open door days (first Sunday of every month, Sunday afternoons and the five holidays listed above), entry to the exhibition halls is free of charge, although the archaeological site will remain closed. Audio guides are not available on open door days. The centre also offers audio guides to the archaeological site that can be used by visitors seeing the site from the balcony. It also includes information about the permanent exhibition. For group visits with more than 10 people (schools, organisations, etc. ), please contact El Born CCM in advance to make a reservation. +34 93 256 68 50 (Monday to Friday, 9:30 am to 7 pm). Reduïda (Reduced Pink Card) holders. Families with up to two accompanying adults. At least one adult must be a parent or legal guardian and at least one family member must be under 16. Single parent family card holders. Barcelona public library card holders. Visitors holding tourist bus passes are also entitled to the reduced admission rate to exhibitions of €2.40, via an agreement between the iCUB and tourist bus operating companies. Gratuïta (Free Pink Card) holders. Teachers accredited by their school directors or who are accompanying groups of students. Two parking spaces are available for disabled visitors using an adapted vehicle. 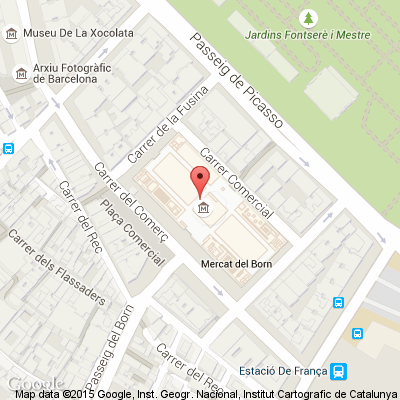 They are located on Passeig de Picasso with Passatge Mercantil. These spaces are situated in the lateral driving lane. For groups coming to El Born CC by coach, there is a reserved drop-off and pick-up space on Passeig de Picasso with Carrer de la Fusina. To access this space, coaches must enter the lateral lane from Passeig de Picasso. Before arriving at El Born CC, please check that your driver knows where to park the coach; if not, please provide them with the pertinent instructions. The reserved coach space is only for drop-off and pick-up. Parking is not permitted.